Welcome to the new era of the Dept of Ed's websites! Not a terribly long time ago (a year maybe?) the NSLDS, FAA Access, and other Dept of Ed websites went to a single login User ID and Password. This made things so much easier when trying to login without having to remember your five passwords and IDs, or even worse having to reset them and have to wait for that to go through. On the other hand, one can assume that a persnickety password and ID apparently weren't enough to make the government feel safe, so this year, the TFA has been introduced. What's the TFA? By the time you read this, most states will already have had this dealt with, but if you haven't had the luxury of dealing with this, here's your intro. TFA stands for Two-Factor Authentication, and it's basically another hoop that you'll have to jump through to access your Dept of Ed login sites. You will still use your UserID and Password, but then it will take you to another screen where you have to input a temporary password. All it has is a power button and that's it. 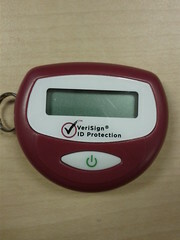 Once you push the button, it will countdown using some dashes, then display a 6-digit temporary password. After 30 seconds, the screen goes blank. Type in this password and you will be able to access your site as normal. For 2012, the Dept of Ed has been making these available in groups of states. Each month on the ifap website, there have been electronic announcements stating which states were coming out that month. Thanks for the article. We all need to be more proactive about our personal account security. I use Two-Factor Authentication across a lot of my accounts. I feel a lot more secure when I can telesign into my account. I’m glad this will be an option. I is nice to have the confidence of knowing that your info is not up for grabs.